I'll defend Lurk on this. Some of this is contextually relevant. Also bully is a strong word. Is it only bullying when it's against GONE? I didn't see that word used in your Skype with the IP tracking "jokes" and the "hey, it looks like the weather where Lord Bane is is such and such. Enjoy the sun Bane!" ^ I laughed so hard at this one I cried. I am literally crying with laughter as I type this sentence. Really? I was laughing my *** off the whole time. That's easily one of the best threads on these boards. Before my post? I didn't see any GONE blue dots at 3 AM. It happens. I live within 50 miles of where I grew up. The people that do it just to be *****, I avoid (kind of like a IRL ignore list, for those of you who don't get out much). The people that do it so we can laugh as a group, and respond in kind, are some of my closest friends. It wasn't simply my intention to laugh at Luisss. In my group of friends we all laugh at crazy **** we said/did to each other when we were kids. Some of those stories are downright embarrassing (and a few are illegal). We all like to see how far we've come over the years. But I guess I have a different social life than you do. I look forward to hearing your "more to say." I'm sure it will be a life lesson for us all. Ah, condescension. That will get me right in the feels. UGH!!! I hate things like this. lets just let the past be the past. And let people dig their own holes this round. Last edited by Pile of Pandas; 02-18-2017 at 03:41 PM. Care to tell me that again? If not to bully Luisss, what was the point? There's a lot here. A lot of nuance and a lot of depth. Go to the very first post in the thread. Luisss screams for evidence for weeks or months just like this round. When sreenshots are posted and he denies them and argues semantics. Sounds familiar doesn't it? What is the subject about? Coordination. This round TRA/GONE coordination is discussed and Luisss screams we are liars and demands proof. He lies to your Skype to GONE and says there is no coordination yet meanwhile I'm sitting on Skype logs, MMs, and messages from TRA leadership that confirm coordination. Therefore BTDT knows, KCCO knows, TRA knows, the only people being fooled are GONE. Follow the string again. In the posts cited Luisss argues what is and isn't coordination and cooperation just like today. Flying Pumpkin challenges Luisss very much like I do. Luisss hides. It's repetitive. There's more... but before we continue... no comment on Lurk being messaged threats? No statement on bullying? Last edited by Lord Bane; 02-18-2017 at 03:49 PM. As I mentioned to Luis via PM, this thread is the epitome of everything that we've gotten from him. The posts that I quoted here are the best examples of the worst. Everything goes uphill from what you see in this thread. I've tried to acknowledge improvement and growth at many points throughout this server. I've tried to give advice that I've had to learn from the school of hard knocks. I've tried to offer assistance, even, where I could. I have, in public and in private, over the span of several years, defended Luis when people have tried to diagnose him with some kind of psychological problem. I did so again just a couple weeks ago. What I was hoping, besides catharsis at least on our side was that you guys would see this as an opportunity to have some empathy for us....But I, personally, was able to laugh at this thread because I see a fair bit of myself in teenage Luis. I have explained this to him in greater deal via PM. Yeah, maybe we took it too far and it was wrong of LB and me to necro this thing. Now, I'm going to ask that people stop messaging me with threats etc. I would like to get some sleep at some point. My job requires me to work a lot of overnight hours and this doesn't help. I didn't try to justify anything. Slow down and think. Just....slow down a bit. And how am I supposed to know about PMs? If he's getting legitimate threats, then yes, that is bullying as well. Last edited by Pile of Pandas; 02-18-2017 at 03:58 PM. And how am I supposed to know about PMs? Because he stated it in his post. As I stated above. I think we posted at the same time. I'll give her the benefit of the doubt for not seeing the post (it's the last one on the previous page, and the forums take you to the post you just made, which in her case is the first post on this page). I'll let her read and I will wait for her response before adding anything else. It wasn't meant as a pedo joke. Poor analogy, I admit and apologize for what it implies. However, I meant it as we're afraid to do or say anything because you are always watching. Like, you are waiting to catch us with our pants down and use it to your advantage either in game or here on the forum. I'll let her read and I will wait for her response before adding anything else. "hey, it looks like the weather where Lord Bane is is such and such. Enjoy the sun Bane!" She quoted it but didn't acknowledge it. State your tracking players in real life and go so far as to post weather reports and it's fine. Pull up a post from 2012 though that mirrors today's conversation and it's bullying. Edit: She posted while I posted. If you're not cheating what is there to possibly be afraid of? Do good. Don't do wrong. Last edited by Lord Bane; 02-18-2017 at 04:09 PM. Right, I see where I came across as snarky, there. My only excuse is that, for me, it's basically 1AM due to sleep schedule. Pretty much just running on mountain dew and Chopped! salad fumes right now. I did look forward to your reply. By the way, have you tried the choppped! salads? Man those things are badass. If you're not cheating what is there to possibly be afraid of? Do good. Don't so wrong. oK, Im confused. Where did someone say what the weather is like where you are? I searched skype, nothing. Was it here on the forum? 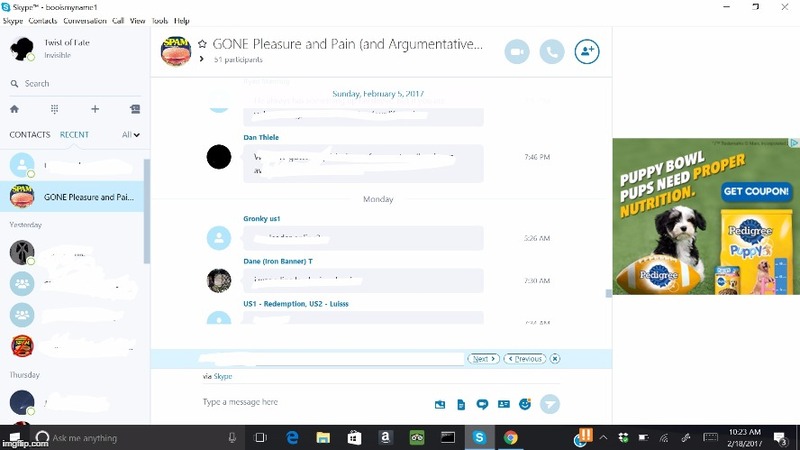 In your "GONE Pleasure" Skype room last week or week before. Last edited by Pile of Pandas; 02-18-2017 at 04:30 PM. No idea why he said that. I've said it before and I'll say it again, tracking isn't cool at all. And his mentioning (if it's accurate, especially) the weather where you are is seriously creepy. Lurk, thanks for necro'ing it.. You and LB both, thanks for pointing out the patterns and similarities are still the same..
Luisss argued just this round that BTDT can not claim a win because forcing the Natars to win is not "within the games parameters", but yet he argued for days that his single troop can be a hammer even if it goes against the games parameters.. I have tried to say many times how Luisss employs one side of an argument or the other depending on HIS situation.. There are a ton of other arguments in this thread that are eerily similar to today, from back when he was "a kid" and says he has changed now.. My response..? Well, I respond with one of my all time favorite quotes..
"Those who do not know history, are doomed to repeat it.."
I would offer the advice to any of GONE's members to seriously consider reading the posts contained in this thread from the beginning before coming to Luisss' defense as you do.. Blindly defending him does reflect upon you.....how it reflects is up to you.. They say ignorance is bliss, but I say willful ignorance is self loathing..
Last edited by odinloki; 02-18-2017 at 05:04 PM. No idea why he said that. He said that to intimidate. I'll save this in case they seek to intimidate anyone else. Despite having had an extended break both from the forum and the game. LOL. I remember this! I was a hypocrite because I admitted to being a sinner (as all Christians ARE) and Christian because I DARED to play with an atheist. I'm an oddity because I have friends of many different faiths, sexual orientations, race, etc etc etc. As Lurk said; but, it's more than that. The game has dropped off so much that we're now playing a server where apparently only one alliance is trying to build a WW. I liked the days when all 4 quads had WW's. SOOOOOO much more drama and fun. SOOOOOO many people to troll. Now we're stuck with the one troll we've been dealing with for years. History repeating itself over and over. P.S. I enjoyed the walk down memory lane! I also see that Luisssss was calling me a liar back then too. LOL. See? Repeating. Now we're stuck with the one troll we've been dealing with for years. History repeating itself over and over. Maybe we're dead. Maybe we`re living in our own personal hell or purgatory. Like Ground Hogs Day. Forced to replay the same servers and the same arguments for eternity. as a group, tried much harder to acknowledge classy behavior and well-run ops and hits for the last several months. Thank you for that. It has been valued greatly. But I also couldn't help but notice the post count and history on most GONE forum accounts. You guys haven't had to deal with what we have. In gesture of fostering any more fun conversations or continuing to build a mutual respect I would like to take an opportunity to share more about myself regarding Travian history with you, if you will have it. Unless I have misread, I believe you have sent me a short but very respectful message in game and private comment in forums before. If you see no interest then I will not cloud your conversations up, but know that I am around if you enjoy interacting with people that have a breadth of experience that you speak upon. Wherever that platform may exist most positively for you. You've experienced the vastly-improved version of Luis that you only get to see when he's an ally. You haven't had a chance to see it from the perspective of people that have been playing on opposites sides of the same game for years and years. Respectfully, this is the only version of Luis that I am interested in knowing on this server. I can't go back to the past so why would I waste emotions on it? If he has grown since then it shows ability learn, if not then this conversation still doesn't apply to me because I was not here for the origins of your guys' collective relations. I only mention this to help share my perspective that I do not see value in damning a loyal teammate over things that cannot be changed (history). That being said, you might notice I have personally stayed out of current conversations as well that seem to focus on Luis. This is not out of a lack or respect, but as I said in private I feel respectful letting teammates surf the seas of public conversation on their own. If my help was asked for I might consider differently, but this has not been the case. I have made multiple points of disclaimers warning of the high tides in these seas, and that anyone wishing to go for a swim must do so at their own risk. What I was hoping, besides catharsis at least on our side was that you guys would see this as an opportunity to have some empathy for us. I am unaware of the details of this, but if there is anything I can do to dissolve the problems and cultivate a change towards positivity again please share with me and give me a chance to help. The game has dropped off so much that we're now playing a server where apparently only one alliance is trying to build a WW. I liked the days when all 4 quads had WW's. SOOOOOO much more drama and fun. SOOOOOO many people to troll. I feel for you, my opponent. Believe it or not I tried really hard to set up a 4 quad server early on. Nobody told me to and I do not claim ownership of the happenings of a Travian server in any way, but I miss what you recall as well very much. I can point out a lot of efforts I made to bring more balance of power in game and fullness of spirit on the forums, but it didn't quite turn out as desired. At least we have found a way to create a team vs team effort to look forward to in some way and I still wish for the best outcome for both sides of what's left to come. What can be broken, must be broken. I may be biased. Certainly i have cause to mistrust anything coming from Luiss. As a queer, pagan feminist I've read more judgmental crap coming from him toward people like me than I really want to remember. He may be less judgmental now, I haven't seen him in action in Gen Chat often enough to make my own assessment on that. But I don't see a lot of change in how he behaves on this forum. He may be different elsewhere, but his manner of presentation and discourse here annoys me greatly. The only reason I haven't put him on ignore (as I have done in the past) is because he is in leadership of a major alliance on this server and therefore may say something of relevance to the game. I would not be surprised if he finds me annoying, either, as he has shown himself to be opposed to almost everything I stand for and believe in. he has shown himself to be opposed to almost everything I stand for and believe in. Honesty, loyalty, tolerance, respect, equality and humility? I'm sure I missed a few. I have let this Necro go on for too long so I must now Lock this thread. Feel free to start a new thread and quote this thread as reference if you wish.